Let's Be Real - Backing A Baby Is One Great Parenting Tool! 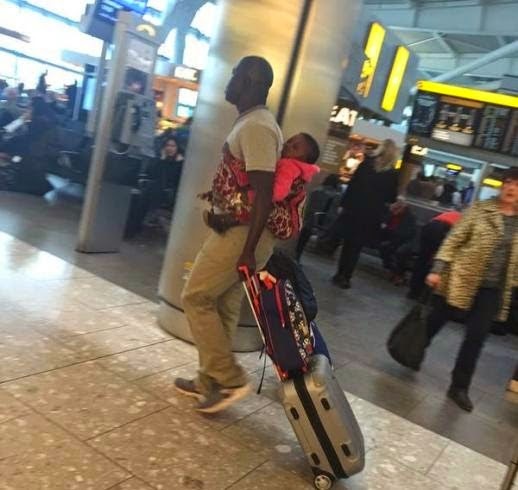 According to twitter user @GabbyDarko, he sighted this UK-based African father at Heathrow airport carrying his baby on his back with wrapper to board a flight to Ghana. Many online reports are laughing at the father, and asking what happened to a baby stroller. I think it's cute and we should never be ashamed of our culture, though some can be baseless, some of them have very good reasons behind them, like this one. Putting a baby close to the parent is one of the few scientifically backed parenting actions that soothes the baby as well as bonds it to the parent. Let's not knock it at all. And whether in the privacy of our rooms, or in a busy airport, let's be real! If you want to be too oyinbo-ish, you can get a sling or a backpack baby carrier, but if you ask me, oja and wrapper is so low tech and easy to do, so it gets #1.